Hi everybody, welcome to Curitiba. I started this collection with the pattern I made for Bonnie's first class, Intro to Surface Pattern Design : Learn Adobe Illustrator | Create Patterns. It came naturally to me to continue de process and make a whole collection from this first pattern. It's winter time here in the South of Brazil and I love this season because I can enjoy a lot of the things that are part of my affective memory such as eating pinhão, going to festas juninas (made a pattern with this theme for Pattern Design I: Creating Inspiring Repeats from Elizabeth Olwen) and having the privilege to have spring way before the season come thanks to one of the most gorgeous tree we have around, the Ipê amarelo that flourishes at the end of August and bright up the city with a gorgeous yellow collor. One day Pantone is going to have a yellow color named Ipê, I'm sure! You can see the tree in my moodboard below. I chose my favorite tree, that is also a city's symbol, the Paraná pine and its seeds (pinhão) as one of the elements; the wonderful Ipê flower; an animal that can be seen in many parks around the city (capivara) and some turistic atractions. To complete the patterns I used some photographs of plants I took during my walks. Some of the skeches I made for the project. To make my sketches and build my patterns I took inspiration from J. Borges a folk artist from the northeastern of Brazil best known for his woodcut art and the "literatura de cordel" that are cheap chap-books or pamphlets written in verse telling stories about local catastrophes, popular legends, infamous love affairs, etc, illustrate with woodcut images. 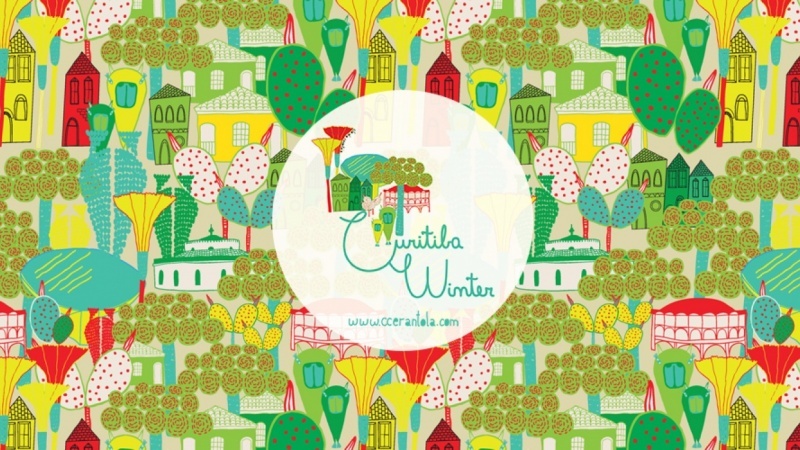 Now I invite you to wander around Curitiba with me in a nice winter afternoon. Let's start our wander with the afternoon colors. And finish our wander with a beautiful sunset. For this second palette I did what Bonnie does in her collections. I took some colors from the first palette, the four at the top and add six new ones. Enjoying the wonderful colors of Ipê's flowers. Stopping by to eat pinhões. Walking on the petit-pavê sidewalks towards the historical center. Finding a nice and curious plant growing on the sidewalk. Discovering the nice historical buildings in the city center. Finishing this wonderful wandering at one of the city's park with flowers, trees and capivaras. Hope you have enjoyed this wandering with me in my city. Now you can shop some nice stationery to bring back home and keep remembering our nice afternoon wandering. I used the mockup from Elizabeth Olwen's class Pattern Design: Bring Your Artwork to Life on Products.